Vintage jewelry has been in the public eye for decades now. Beautiful rhinestone brooches grace celebrities and fashion runways, mainstream magazines tout vintage style regularly, and young women in the twenty-something age range are all about the bling. Even newer jewelry sold in department stores has the look of older styles. With all this attention being paid to vintage rhinestones, baubles, and beads, reference guides are bound to follow suit. There are dozens of jewelry titles available for collectors to pore over for information, and new guides being released regularly. Some are far better than others in terms of accurate information. Just keep in mind that when you pick up an older title on vintage jewelry, that like with most history books, new information may have come to light since those books were written decades ago. It's sometimes wise to double check information before adding it to sales listings or committing it to memory. Another thing to keep in mind is that all books on vintage jewelry have subjective pricing. That pretty much means it's meant to be a guideline and nothing more. The market can change over time and varied factors that might not suit your circumstances went into coming up with those figures. Use them to get a general idea about what is valuable and what is not. One question on a potential reader's mind: is this a comprehensive book? No, there's no way an author could include everything there is to know about collectible jewelry in one moderately priced book (list price $26.99). It does provide a great overview for beginners though, and it includes facts, detailed sidebars, and other information that even seasoned collectors have found to be useful according to the numerous favorable reviews on Amazon.com. What you'll find in Warman's Costume Jewelry (Krause) is a text broken into three sections starting with jewelry covered decade by decade. This ranges from Victorian jewelry made in the late 1800s through contemporary pieces made in the 2000s. Section two covers 20 major designers and manufacturers of vintage jewelry, along with a supplemental marks guide that includes many covered earlier in the book. And section three, which is often the most valuable to beginning collectors, helps with dating and identifying jewelry based on components such as stones and clasps. The later chapters also include information on identifying unmarked (usually referenced as unsigned by jewelry collectors), which can prove to be valuable as well. This book was written by Melinda Lewis who co-founded Costume Jewelry Collectors Int'l. She put 11 years of research and even more effort on top of that into producing this 1,000-page guide that weighs close to 10 pounds. The only complain from users of this vast reference guide is in relation to the weight, as a matter of fact, because the book usually pays for itself with a couple of uses. Napier fans and dealers marketing vintage Napier jewelry alike get their money's worth out of this tome many times over. Of particular interest in The Napier Co. (Life by Design Publishing) are the sections on jewelry made by Napier from the 1920s through the 1960s. These are the scarcest and most valuable Napier pieces, and most collectors and dealers never run across them. Or, they see the name Napier and think about run-of-the-mill department store jewelry not knowing what a treasure they're holding. That's one of the things that makes this book so valuable, not to mention that it's a treat to learn about all that amazing boutique jewelry made decades ago. Lewis also includes jewelry industry history in each decade-by-decade section, so there's more to learn in this time than just about Napier as if that wasn't enough. While many costume jewelry books produced in the past have been overviews of the hobby in general terms, Miriam Haskell Jewelry (Schiffer Publishing) focuses on the pieces produced by one company from the 1920s through the present, and the cream of the crop collections shown in the book are nothing short of spectacular. This book is a gem for collectors looking for reliable text and tons of photographs of Miriam Haskell pieces, but would also interest anyone enamored by high style and vintage fashion. Original design artwork adds an interesting element to one section of the book. But, experienced collectors and beginners as well will relish the information provided on unsigned Haskell pieces produced from 1926 through the mid-1940s. The photos exhibiting manufacturing techniques of unsigned pieces are not only useful but surprising in some cases. The only drawback to splurging on this hardcover book is that it doesn't include pricing for common Haskell pieces found most frequently in antique shops and thrift stores today. But, honestly, you shouldn't that keep you from buying it. The information on unsigned pieces alone with well worth the price, and a single bargain buy made with your new-found knowledge will recoup the price of the book and then some. Pamela Y. Wiggins is the author of Warman's Costume Jewelry and the co-founder of Costume Jewelry Collectors Int'l. The other books featured here were purchased by the author. Review copies were not supplied by the publishers. 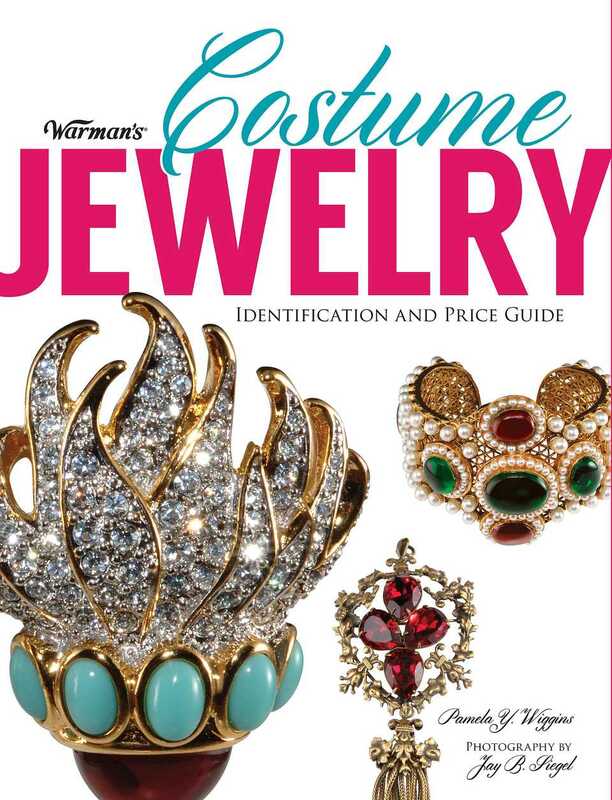 Do You Really Need a Copy of "Warman's Costume Jewelry?"